Fabric weight is, unfortunately, all too common a measure by which most fabric quality comparisons are made. A heavier fabric is generally, and incorrectly, accepted as a better fabric. In fact, fabric weight indicates nothing about quality and very little about density, pile height opaqueness, etc. In most cases fabric weight doesn’t even relate very well to the actual finished weight of the fabric. Weight, as it’s generally applied, is one of the most inconsistent measures for fabric comparisons. Fabric weight comparisons between different mills or between different product lines within a mill tend to be inconsistent, apples to oranges, comparisons. Fabric weight is generally, but not always, measured by linear yard, even though fabrics come in all different widths. (A 20oz 54” wide fabric and a 20oz 72” wide fabric will be very different.) 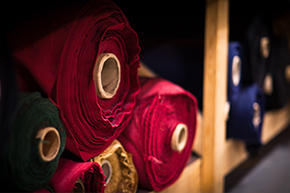 To make matters more confusing, it is often difficult to determine if the weight stated refers to before or after dyeing or flame treating, both of which can add dramatically to fabric weight. In addition, different fibers will require different amounts of dye and flame retardant, which causes inconsistent weights. The only useful comparisons with regard to fabric weights are those to get a general sense about the fabric (is it a heavy velour or duvetyne? ), and those made to compare products within the same product line from a single mill. Generally, the mill will adopt the best methods to demonstrate the differences in their own fabrics. These methods are less about what the fabrics actually weigh and more about how the various fabrics compare with one another. The final consideration on fabric weight is that even if all things were perfectly equal, you do not necessarily want the heaviest fabric you can afford – you generally want the lightest fabric that will do the job. Heavier fabrics will provide more sound absorption. Heavier fabrics will not be more durable. In fact, the added weight adds considerably more stress to the top seam. Heavier fabrics are also more difficult to handle and require heavier duty (and more expensive) tracks and rigging.